Removing swarms as they hang in a tree or bush is about the easiest way to get free bees, depending on where they chose to hang out while the scouts search for a new home. The problem is, getting to them before they decide to take up residence in their selected home. For the spring of 2014 I have went to 6 swarm calls. The first four left before I could arrive on location. The fifth departed JUST after I arrived, and number six is now taking up a spot in one of my Outyards. Video of catching this little swarm below. While waiting for my mom and pop to arrive with the Bee Vac I intended to use to catch them in, I watched them dance, and saw the queen appear from the cluster several times. If I had my clip I could have easily caught her. As it was, I was in the area doing an estimate for a cut out and the Gentleman I was talking to spotted this low hanging swarm over my shoulder. It is not often I am in the right place at the right time. I will take them when I can get them! On July 11th, I did my last one week inspection. From May 1st through the middle of July I inspect every week to check for swarm prep. 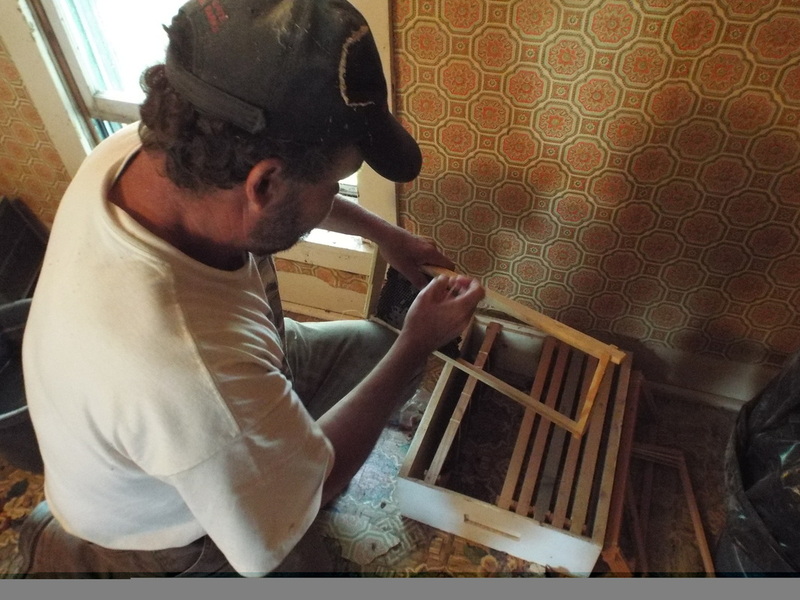 I manipulate the hives to insure the bees have plenty of room, do light splits etc, all in an effort to prevent swarming.. I "was" quite proud that not ONE of my hives swarmed this year.. So it was July 24th, two weeks from my last inspection. I was working the nucs at the home yard, and heard the roar... You have GOT to be kidding me! Cut outs are not usually as easy as catching a swarm. A cut out usually takes a minimum of four hours. Sometimes as long as two days depending on where the bees have taken up residence. I will be adding vids and pictures each time I do a cut out, so check in often! For some great entertainment, Check out JP's site, or do a search on You tube! Link Below. I took the camera along to this one. We got some good Video and pictures. Follow along and enjoy! Partial video of a Barn cut out my daughter and I did this spring. My minion had some trouble operating the camera with her gloves, and then the Battery died, so this vid stops sort of abruptly. Still worth a quick watch. 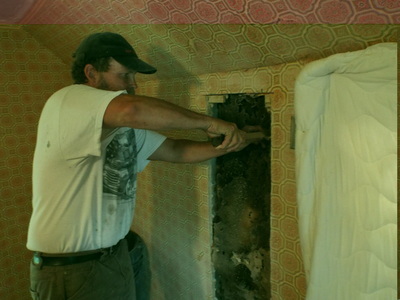 Removal from a house wall from the inside. This removal went a very different direction than was expected! Minion and I went up to this house to do a simple quick removal after I did a preliminary inspection a few days before. It was rainy and cool when I did the prelim... 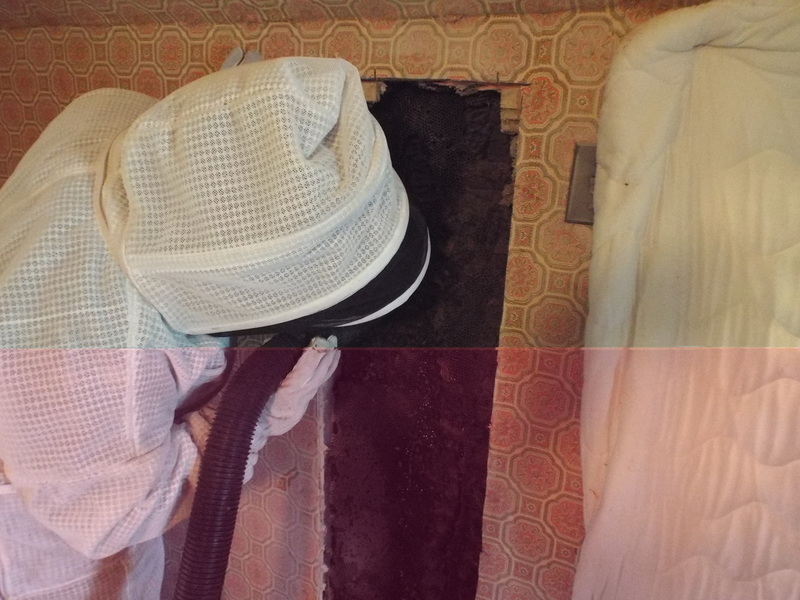 I could not see any bee activity near the chimney of the house where the renter indicated He had seen them. There was however a stain in the ceiling that looked like honey.. Unfortunately, pulling an easy to remove wide pine board from the floor revealed that there was no hive over the stain, and had never been a hive in the location. I replaced the board, and went outside to do a bit of looking. I saw no activity around the chimney, though there were two locations bees could have been accessing the wall... A little further examination was in order. I walked around the house, and almost immediately spotted bees in a corner where two roofs joined.. Closer examination revealed that there would be no removing those boards without compromising the roof, so the decision was made to locate the hive on the inside, and remove a section of the wall. As shown in the pictures above, it did not take long to find the right spot with my stethoscope. 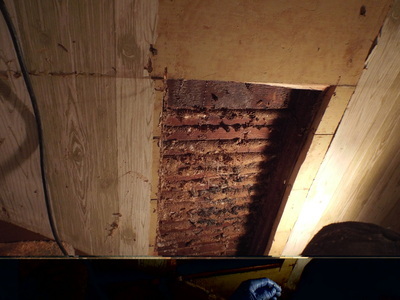 A small cut was made to be sure, then the studs were located, and the wall cut between those two studs to reveal a hive that extended below the floor. Removal of the wall section in the stairwell was required to find the rest of the hive. In total length it measured just over eleven feet from top to bottom. 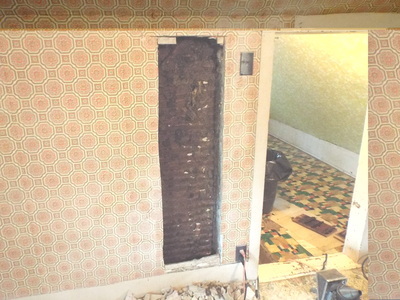 Once exposed, it was not difficult to begin removing bees and comb. The bees were exceptionally mellow, so I chose to do without my bee suit. My Minion is not as trusting, and opted to wear hers. A wise choice as far as I am concerned.. I don't wear mine unless the bees force me to it. Being hot and uncomfortable is as bad or worse than a sting or two. I did receive a few stings to the hands, but those were the result of reaching down between the walls to pull out comb and grabbing a bee or two.. Hurt them and your guaranteed to be stung. No bees out and about offered to sting. Good calm survivors that had been living in those walls for at least five years. The queen was spotted, and captured in the upper level of the hive. She is a golden queen that looks fat and healthy. All comb was removed with the exception of old pieces that had fallen all the way to the bottom of the wall. Those were left so that we did not have to access the bottom of that wall through the bedroom side. The Bee vac performed admirably. I am going to guess that there were a full six pounds of bees pulled from this hive. When the lid on the bee vac was popped in my outyard I found perhaps fifty dead bees among the thousands of live ones, so a good removal was accomplished for good people. The bees are relocated and have a second chance. Sharroll told me her name, but she has a soft pretty voice.. When I smile and nod my head like an idiot that means I didn't hear anything that was said... The result of being a Mechanic and Gunsmith for way too many years. Mike the owner, Mike and Sharroll the renters. It was a pleasure to meet them, and a pleasure to get the bees cleared out of their house. One of the best things about doing removals is the incredibly good people you get to meet along the way. Learning about trap outs from the master himself. He has a write up at WWB Forums that goes into greater detail about doing a trap out, I will put a button below to take you directly there. I'll not even attempt an explanation. If you want to know how to get the job done, you may as well learn from one of the BEST. The Link above has some GREAT information on swarm traps, sizes and locations. Slightly different method than mine, but it WORKS so check it out! Rob will not steer you wrong! When honey bees make the decision to swarm (not the queen, the bees) they will boil out of their home, and collect on something nearby. At this point, they have not selected a new home. They have no idea where they are going to go yet. They may remain here a few minutes, or a few days. 200 or so scouts will spread out in all directions and begin looking. A scout will spend 45 minutes inspecting a promising location. Walking around inside the cavity multiple times, flying in and out of the entrance. The rest of the bees in the swarm will remain clustered, conserving energy. They have filled up on honey in preparation. This honey causes these bees to begin producing wax. Often after a swarm leaves a branch you will find many deposits of wax on the branch/surface they clustered on. The scouts will return, and report what they have found through their dance. The SCOUTS come to a consensus, and will ALL begin to perform the same dance, indicating the same location. You can see the scouts dancing in the video I posted above. The bees are 95% accurate in choosing the best location they can find. According to the research done by Tom Seeley (Honey Bee Democracy) they like a cavity of 40 liters, which converts to approximately 1.4 cubic feet of space. My boxes measure at about 1 cubic foot. Not perfect. But I know from experience that they catch swarms, so what gives? It depends entirely on what else they have to choose from. They WILL choose the best option they have available. Apparently they have been choosing my boxes because there are no better options. Entrance size and interior space appear to be the greatest determining factor. 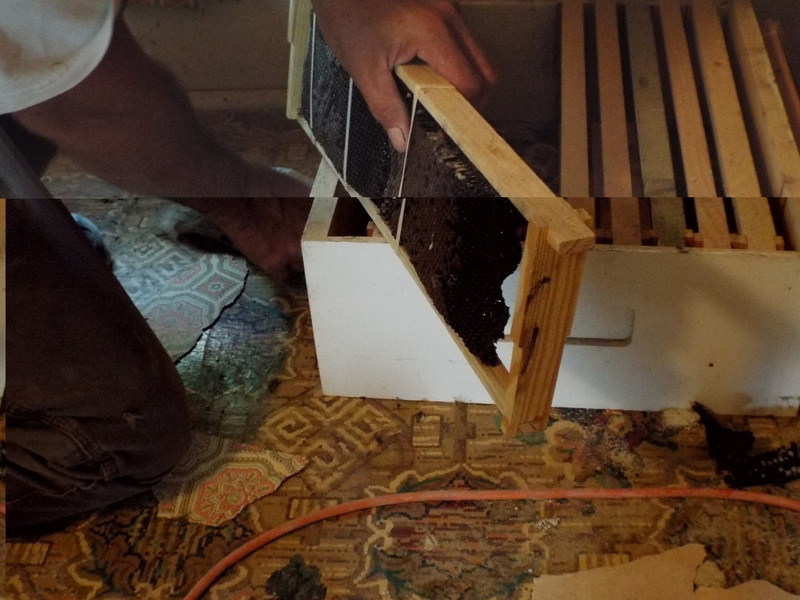 Most of the studies I watched and read about were done with the "choices" the bees had about a foot from the ground, using different boxes of various internal size. I would like to have seen the effects of a smaller box placed ten feet from the ground compared to a box of larger size a foot from the ground, but this was not done. I would have also liked to have seen results of a larger space, as well as space filled with frames, and locations BAITED with old comb or swarm lures of differing types. This was also not done so it will be up to us to figure that part out. Decision made.. the bees will rapidly take flight, and the entire swarm will move toward the destination. Some claim you NEED a ten frame deep box, or at least one of equivalent size. I wont argue with that. 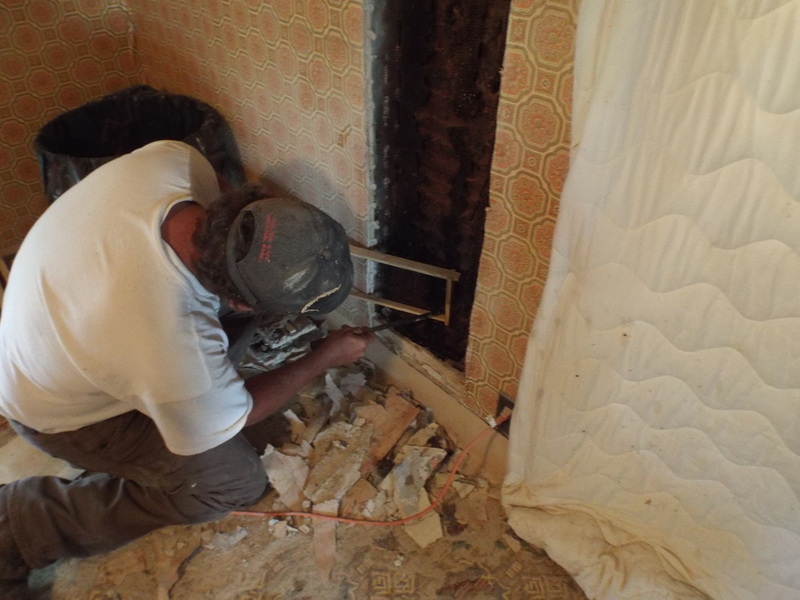 A single deep has a space of about 1.6 cubic feet, if a standard bottom board with 3/4 inch space is used. Some claim to do fine with 5 frame NUC boxes. I wont argue with that either. A 5 frame deep nuc has the equivalent space of about .823 cubic feet..
Why don't I argue with this then? Because.. as stated above, the bees WILL choose the best location available. If there is nothing else as nice as that 5 frame nuc available they will choose it. Yes, I WILL argue with that. I would prefer not to have to do a cutout when I catch a swarm. It is so much easier to simply swap the frames from the trap, into a hive, close it up and let them go to work! If you are capable of checking this trap on a daily basis it may be a valid option. I have a couple 5 frame deep trap boxes, the rest are 8 frame Medium boxes. A normal 8 frame medium is 6 5/8 inches deep. I don't cut the swarm boxes down, I leave the board its full width of 7 1/2 inches. Nail/Glue the bottom on it, and use screws to hold the top on. I make the entrance about an inch and a half wide and around half an inch tall, and I run a brad nail up through the center of it for a little added protection. A board screwed on the back allows me to screw it to a tree. Everything says this box is too small, but they work.. If the bees have no other good options. Based on the information from Rob's site, and what I have read and seen other places, I will be making a few swarm boxes to test the research. 8" depth, 17" wide, and 18.5" long inside dimension gives 1.456 Cubic feet of space. I can still use my medium foundation-less frames. 12 of them per box. Set these out a few yards apart from the smaller boxes I normally use and see what happens. I will not be carrying these out to some of my traditional locations. The smaller boxes are heavy enough. I will use them where I can access them.. Basically, where I can get the truck within a few dozen yards. The claims are, that you need to put the box up in a tree 12 to 15 feet. It may well be a fact that a box at such height is more enticing to the bees. But it isn't at all enticing to me! 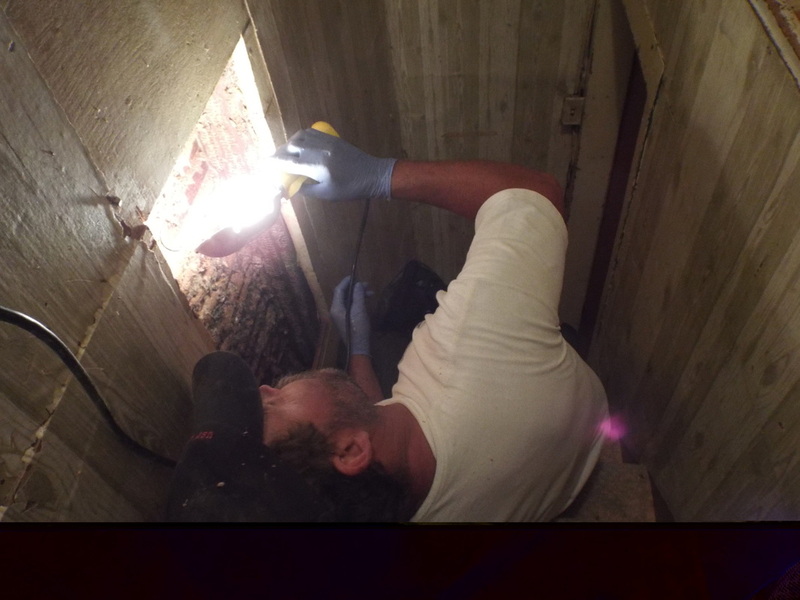 Having removed bees from under houses, from tanks laying ON the ground, from old cars and other equipment, as well as finding hives in trees with entrances no more than a foot and a half from the ground.. I would have to challenge the 12 to 15 foot statements. In the research vids I have watched, the tests were done in boxes one to three feet from the ground, and in each case the bees chose one of those locations. The height choice is a personal one you need to make. I use commercial swarm, AND Lemon Grass Oil. See pic at the bottom. Commercial lure on the top bars, a dab of lemongrass oil from a cue tip near the entrance. I don't use old comb, wax moths here are terrible. Wax moth infestation would drive the bees away rather than luring them in. I use foundation-less frames in most, a few have plastic in between the empty frames. Thuricide BT Spray is used by organic gardeners to spray plants. This material (containing Bacillus thuringiensis Kurstaki, .8%) is used to kill plant eating caterpillars, moth larvae, Gypsy Moth larvae and other leaf eating worms. Controls alfalfa and redhumped caterpillars, cabbage looper, omnivorous and fruit tree leaf rollers. For use on alfalfa, broccoli, cabbage, mustard greens, melons, tomatoes and others. A fine Gent from World Wide Beekeeping forums sent me a sample of Xentari BT to try out. I intend to do just that in my swarm traps. His instructions say to use 1 teaspoon of this brownish grainy powder per quart and spray each comb. IF I have no issues with wax moth, AND still catch swarms, I will spray some combs for storage next winter and see if they get destroyed by Wax moth. Whatever happens, I will let you all know! I have found bees in STRANGE places, from combine tires to old water tanks. Car trunks to abandoned tool boxes. MOST of these things were laying ON the ground. Yes, I have done cut outs in house eve's, in churches, and I have found bee trees with the entrances 25 feet from the ground. I have also found bees UNDER porches, in crawl spaces, and in bee trees only a foot from the ground. I have cut bees out of hollows smaller than my swarm boxes, and obviously MUCH larger. I have seen bees build comb in barn rafters with Nothing around them to protect them except the barn itself. Given a choice, the bees will choose the BEST home they can find on short notice. When it comes to swarm boxes, I don't give them a choice, I offer them my boxes, one size fits all at the height I am comfortable with. Thankfully, they choose to accept the invitation often. The Picture below was from a cut out I did in an old water tank, thirteen inches across and about two feet long. It was laying ON the ground. The entrance hole can see to the right, it was a one inch hole facing straight up and open to the elements. 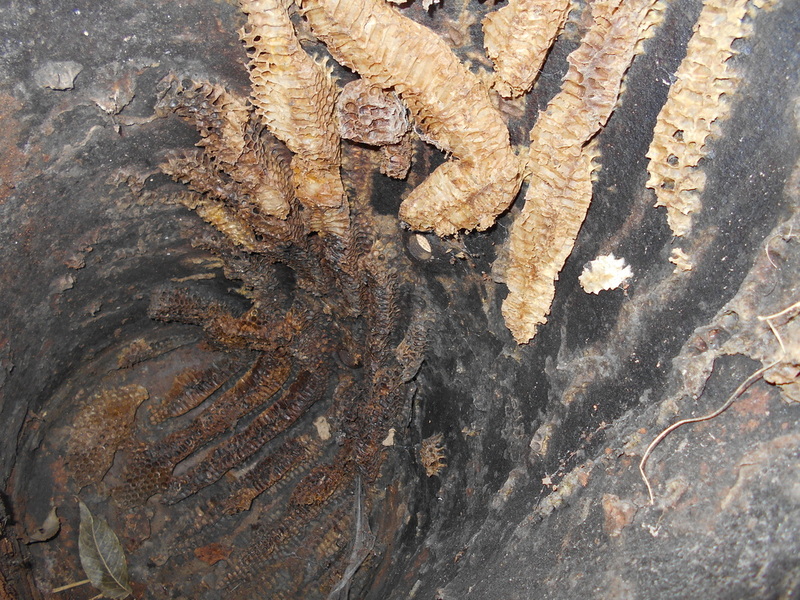 The bees had been in this tank for quite a while and seemed to survive it well. Some better pictures of the box I use below, All painted, cleaned and ready to go to work! I'll add pics of the larger boxes when I get them done. 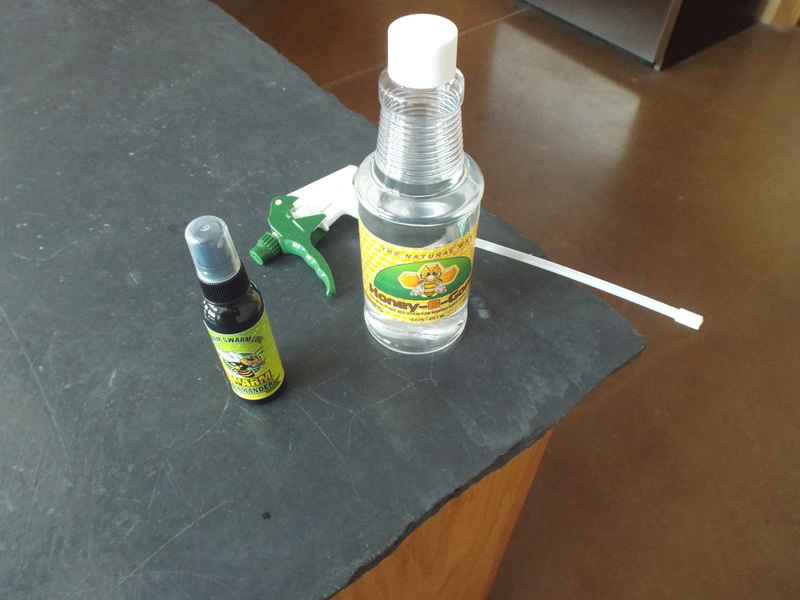 A picture of the lure and Lemon Grass oil I use as well. The Swarm lure from Mann Lake is kept in the freezer until I am ready to use it. I staple it to the top of a frame. You don't open the package, poke holes in the vial etc, just use as is. I have heard claims that its not enough unless you open it, poke a hole in it etc, but in combination with a light dab of lemongrass essential oil, inside the front of the hive above the entrance it seems to work exactly as claimed. My standard box with an internal volume of about 1.0 CF on the right, compared to a 1.4 CF box on the left.. wow.. carrying that thing into the woods will not be fun.. I'm going to see what I can find for 1/4 inch panel and see what I can come up with for a lighter design.. I have to come up with something that will take medium frames and not weigh in excess of 300 lbs. So where to put your swarm boxes? I have heard this described as being similar to fishing. You pick a good spot and give it a try. The problem with swarm boxes is that if you don't get any takers the season is OVER. So how do you go about picking the best spot? You look for feral colonies, and place your boxes near those locations. I discussed places I have found bees above. Put the word out, ask people. Spend some time wandering the woods and streams. Look for flowers and watch for bees on them. When the bees decide to head back to the hive, they will zoom STRAIGHT to the hive. Watch which direction they go. Often a little walking will reward you with the location of the colony. You can look up BeeLining on the net for more information about locating feral colonies. So the time has finally arrived in this neck of the woods.. I started putting my boxes out today. A few dabs of lemongrass oil. A couple drawn comb sprayed with Xentari BT and a packet of swarm lure stapled to the top bars..
Each box is located within 1/4 mile of a known still alive feral colony.. Finding live colonies this year has proven difficult. 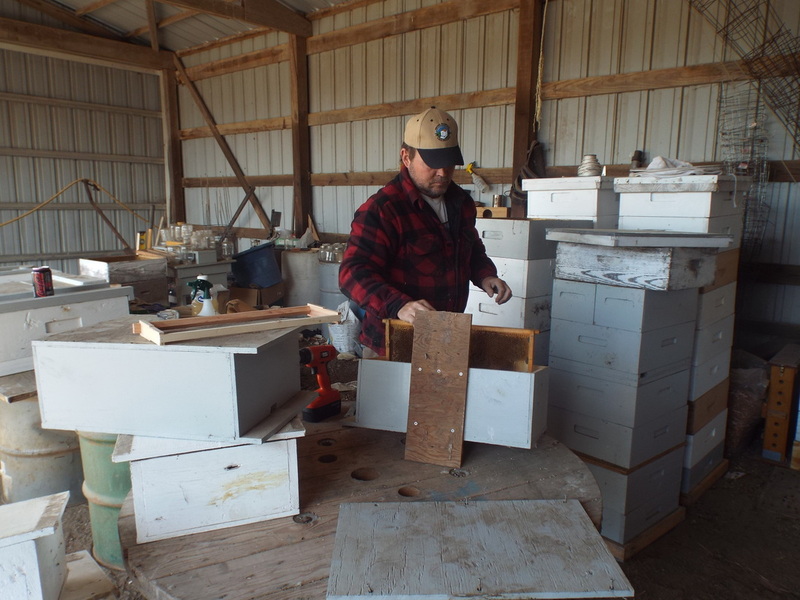 Several boxes I put out tomorrow will go in locations I have caught bees in the past, but I do not harbor as much hope this year as I did last. We will see what happens. Three different box sizes are being used this year. We shall see what the bees choose and what they ignore. I'll add a few more pics when I get the rest of the boxes put up. July has come to a close, so my boxes were taken down. Only one swarms this year in one of the smaller boxes. A lot of scout activity at different times. The Up side to this is, those locations I knew of that died out over the winter have bees in them again. All but two, so if those colonies managed to survive the coming winter, next year should be an excellent year to try this again. The time to put out the swarm boxes is rapidly approaching. I went into my hives to remove the sugar on April 1st and found an abundance of brood and drone brood. We are about three weeks ahead of last year. I hope we do not suddenly have a week of freezing weather arrive, if we do, all of these hives are doomed. This year we are also going to try some Swarm Commander to see how it works. Shown below with a bottle of Honey B Gone. I heard about the Products above from different Forums. 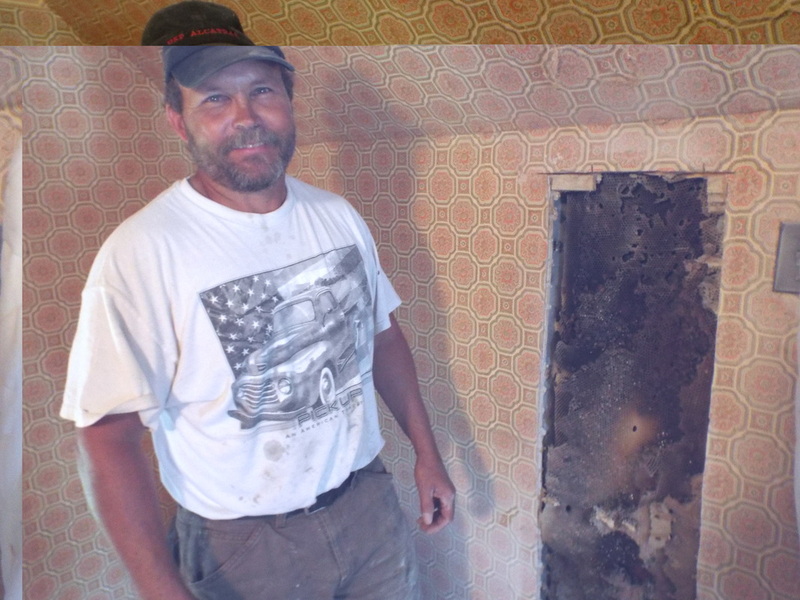 JP The Bee Man uses the Honey B Gone during removals, and swears by it. Scott has posted on WWB Forums, and has an Advertisement there, so I clicked on the link, and read the description for Swarm Commander.. It left a little to be desired as far as instructions etc, so I sent a mail through the contact form... and less then ten minutes later my phone was ringing.. A good conversation led to Ordering both Products. They will be put to good use! Now only time will tell how well they work! I will Update and review once I have done the testing.